My progress on the third Stone Island Sea Story has slowed somewhat since November, back when I tried to parallel NaNoWriMo and wrote a good portion of the story. I doubt if I've written as much in December, January, and no February as I did then. But I am making progress and now am nearing the finish. Hard to tell for sure, but I'm thinking one or two, maybe three more chapters after I finish the one currently in work. (Chapter Twenty Three) I getting to the final scenes and I'm having to think a bit to figure out how it is supposed to play out. 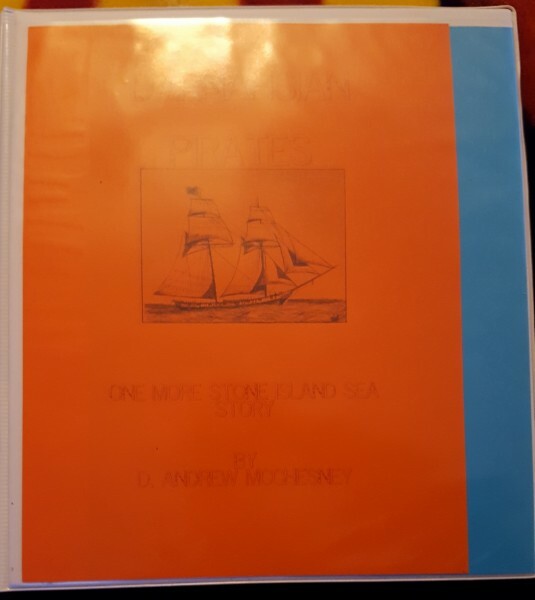 Working Copy of Darnahsian Pirates: One More Stone Island Sea Story. Got a bit of glare so the title above the picture doesn't show up. It's complete up through Chapter Twenty-Two. Even though I haven't finished the story, I'm starting to edit a bit. I've been going through a chapter or two each evening before I sleep, using the printed copy. Most of it is a parring of extra words or slightly rephrasing something that after several months or even years looks a bit awkward. Also trying to just read through it at more of a reader's pace than a writer's. I think the slower pace of writing can cause us to include too much information in our work, especially repeated information. It's because we wrote and included it weeks, months, or even years ago and it feels like we need to mention it again because the reader probably has forgotten it by now. But the reader might have just passed over that particular passage in the recent past, so including it again is a bit of a waste. As writers we need to understand the reader is an intelligent person and will remember more details than we give them credit for. Anyway, reading through it, even while on an initial editing pass lets me see it more as a reader and might help point out pacing and timing problems, as well as the possibility of including too much or repeated information. Still feeling like I should finish the story itself by the end of this month. P. S. Have finished Lee Child's Killing Floor: A Jack Reacher Novel. Haven't started anything new as I might use my daily reading time for my editing. good progress - well done. Over the last few days I seem to be more editing than writing... but it all applies to the end product. I've noticed that as I get into the recently written portions, I'm editing a lot closer. Or I'm finding more things to change, or correct. I think I did some editing on the earlier portion before, so a lot of it was in better shape.